Gold is trading lower and has declined more than $20 on account of rising yield and strong US dollar index. DXY rose more than 100 pips from the low of 94.30. US 2-year yield hits 10 year high at 2.629% on account positive comments from Fed Chairman. Fed Chairman Powell on his testimony on Tuesday mentioned that US economy is growing faster with job market remains stronger and inflation will stay near 2%. The central bank said it is on the track to gradually raise interest rates.The spread between US 2 -year yield has reduced to 23 basis point and this also supporting US dollar. 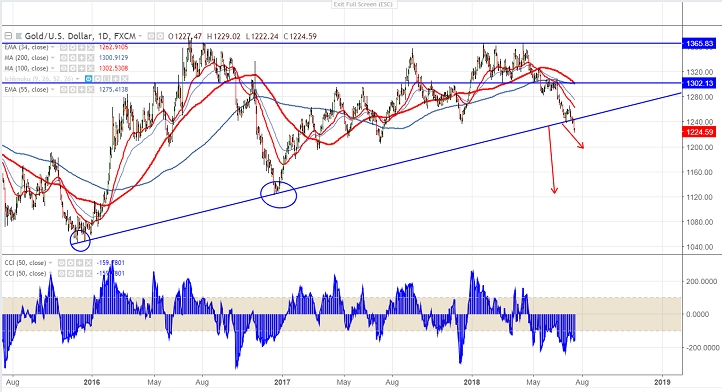 The pair is facing strong support at $1217 and any break below will take the yellow metal till $1209/$1200 (61.8% fib)/$1160. The near term resistance is around $1236 and any convincing break above will take the yellow metal till $1242/$1250. It is good to sell on rallies around $1230-32 with SL around $1240 for the TP of $1201/$1165.